Correspondence between lead ammunition stakeholders, the Lead Ammunition Group and Defra/FSA. The Parliamentary Under Secretary for Environment and Rural Affairs (Dr. Thérèse Coffey) writes to the Chair of the LAG (Mr. John Swift) to reiterate the FSA advice and reassure the Chair that options are being looked at for both improving compliance with existing regulations and reducing the amount of lead ammunition going into the countryside. Chair of the LAG (John Swift) writes to the new Secretary of State for Environment and Rural Affairs (Mrs. Andrea Leadsom) in response to her predecessor’s letter, to respond to some of the points raised and also to draw her attention to further evidence of wildlife population level effects of lead ammunition. The Secretary of State for the Environment, Food and Rural Affairs (Elizabeth Truss) writes to Chair of the LAG (John Swift) to inform him of Defra’s response to the LAG report. 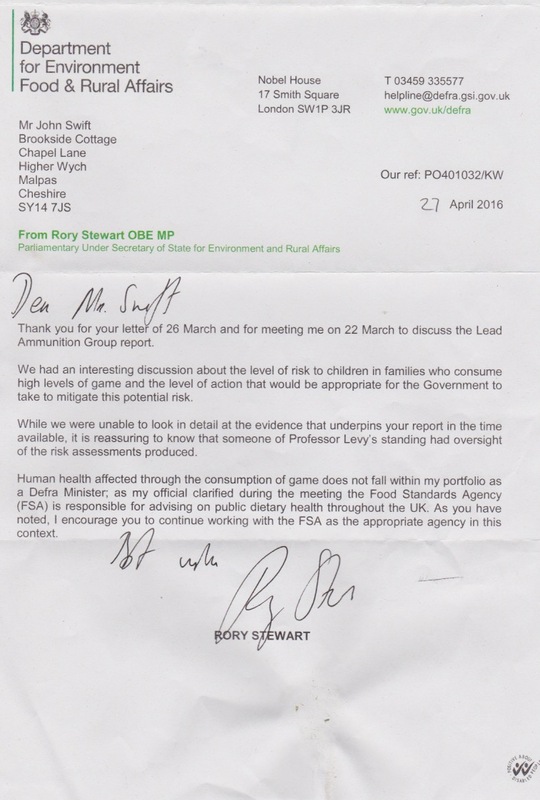 The Parliamentary Under Secretary for Environment and Rural Affairs (Rory Stewart) writes to the Chair of the LAG (John Swift) to acknowledge his reassurance regarding Prof. Levy’s oversight of the risk assessments and to encourage LAG to continue working with the FSA. Chair of the LAG (John Swift) writes to the Parliamentary Under Secretary for Environment and Rural Affairs (Rory Stewart) to thank him for their meeting, reflecting on issues raised in the meeting and proposed next steps. Chair of the LAG (John Swift) writes to the Parliamentary Under Secretary for Environment and Rural Affairs (Rory Stewart) in relation to misconceptions about the evidence relating to lead ammunition and LAG report expressed during a recent Westminster Hall debate; and thus requests a meeting. Chair of the LAG (John Swift) writes to the Parliamentary Under Secretary for Environment and Rural Affairs (Rory Stewart) to acknowledge thanks to other LAG members, describe the on-going use of the LAG website and explain that the LAG will remain in place to provide further information and clarification as required. The Parliamentary Under Secretary for Environment and Rural Affairs (Rory Stewart) writes to the Chair of the LAG (John Swift) to thank him for his work over the last five years and to inform him that the report is receiving consideration and will be made available via the LAG website in due course. The Chair of the LAG (John Swift) writes to the Secretary of State for the Environment, Food and Rural Affairs (Liz Truss) to accompany the final LAG report, describing the risks from lead ammunition and the potential mitigation measures. The Minister of State for Agriculture and Food (Jim Paice MP) writes to the Chair of the LAG (John Swift) to endorse the new members of the LAG. The Chair of the LAG (John Swift) writes to the Minister of State for Agriculture and Food (Jim Paice MP) confirming that the members of the LAG are willing to continue the work for another year. He suggests four new members of the LAG to replace the outgoing Mark Avery, Stephen Tapper, Adrian Gane and Robert Gray. The Minister of State for Agriculture and Food (Jim Paice MP) writes to the LAG to commend the work to date, he approves the continuation of the group for another year. In accordance with the terms of reference of the group the LAG produce their first interim report outlining their achievements since formation in March 2010. In conjunction with the FSA, Defra’s Biodiversity Programme write to John Swift to formally invite him to chair a high level group to look at the issues surrounding lead ammunition, focusing on the possible impacts for wildlife of lead from ammunition, the welfare implications of available alternatives and potential effects from contaminated food on human health. The Minister for Marine and Natural Environment (Huw Irranca-Davies) writes to the Chief Executive of BASC (John Swift) acknowledging the concerns of the various stakeholders and the complexity of the issue. He asks Defra officials to look into the possibility of convening a group to look at possible impacts on wildlife of lead from ammunition, the welfare implications of available alternatives and potential effects from contaminated food on human health. In response to the RSPB/WWT letter The British Association for Shooting and Conservation (BASC) and ten other shooting, game and countryside organisations jointly write to the Secretary of State outlining the popularity, diversity, economic and environmental value of shooting sports in the United Kingdom. They stress that the shooting community does not believe that the case for sweeping legislative or regulatory restrictions on the use of lead ammunition has been made. The RSPB and the Wildfowl and Wetlands Trust (WWT) write a joint letter to the Secretary of State outlining both new and well established health risks posed to humans and wildlife from lead ammunition. They cite new evidence on the impact of fragmented lead shot and bullets and claim current FSA and VLA risk assessments do not go far enough, they call for a more thorough quantitative analysis. © Lead Ammunition Group 2015. All rights reserved.